I had so much fun planning all of the details of our winter wedding. We enjoyed every minute of the ceremony & celebration. I took on the task of planning & designing all of the aspects of our wedding myself. I spent countless hours scouring the internet & preparing for our big day and ways to make it personal. 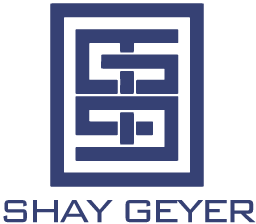 I want to share my resources & ideas with you in hopes that it may lead you to find something you might be searching for. Whether you’re planning your own big day or a special event in your life, I hope you’ll find these resources useful. 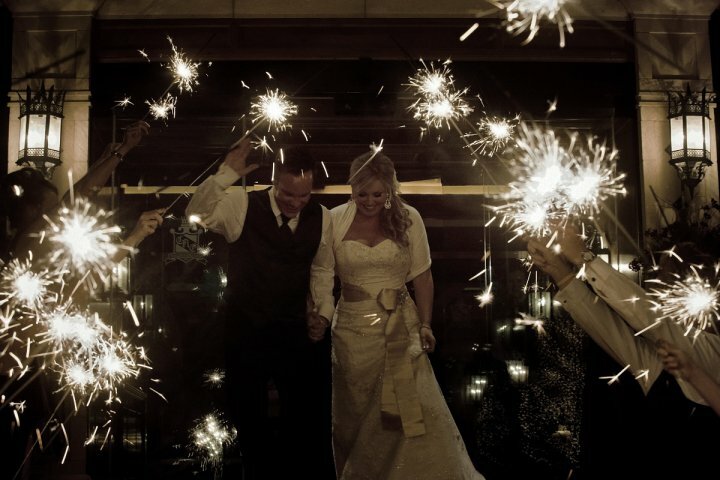 To me, a sparkler send off was the perfect way to end our evening. The guests got a real kick out of it & it made for some wonderful photos! 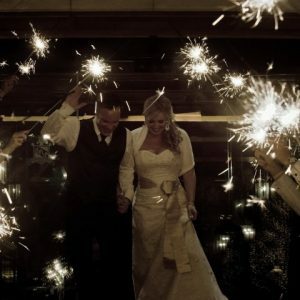 We placed the sparklers in a vase at our reception with a sign that said “Light the way for Brian & Shay”. I found the extra long 36″ wedding sparklers here. 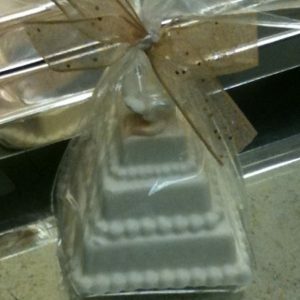 This hand molded solid white chocolate cake was our favor to our guests. It’s actually a replica of our wedding cake. 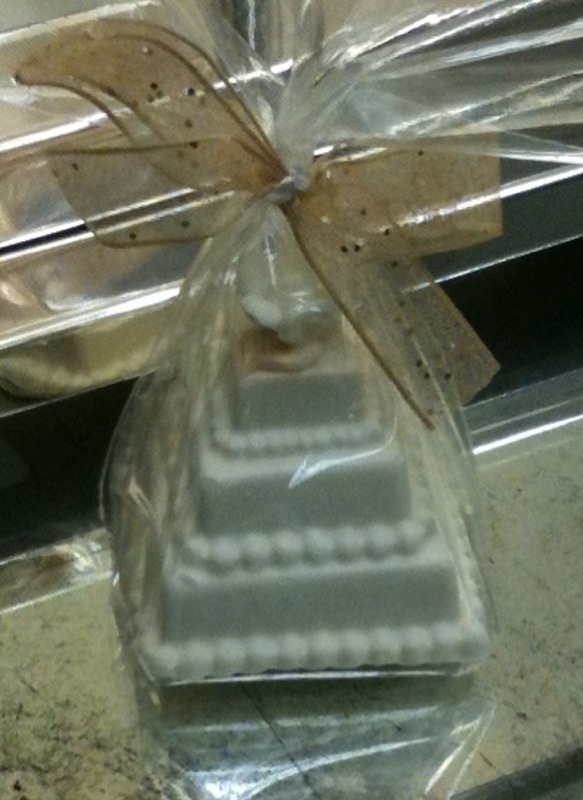 I found the chocolatier at the Dallas Market Center while I was there for the home & accessory market. I was so impressed by their work. I ended up sitting down with them & coming up with the chocolate cake replica as the perfect take home treat for our guests. Our menu cards were one of my favorite decor items for our wedding. I had this vision in my mind of what I wanted, but I just couldn’t find it. So, I began the hunt to find the right items to put it together myself. Then, I stumbled upon the paper & envelopes at Hearts Desire (a local gift shop in Frisco). The paper’s edge is tattered & lined in a metallic gold. 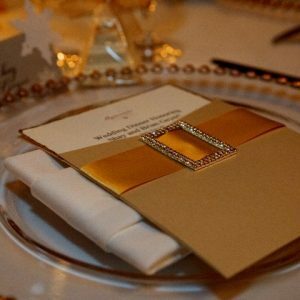 The envelope is a soft light gold. I also bought the 2″ gold ribbon from them. I found the rhinestone buckles on-line here. 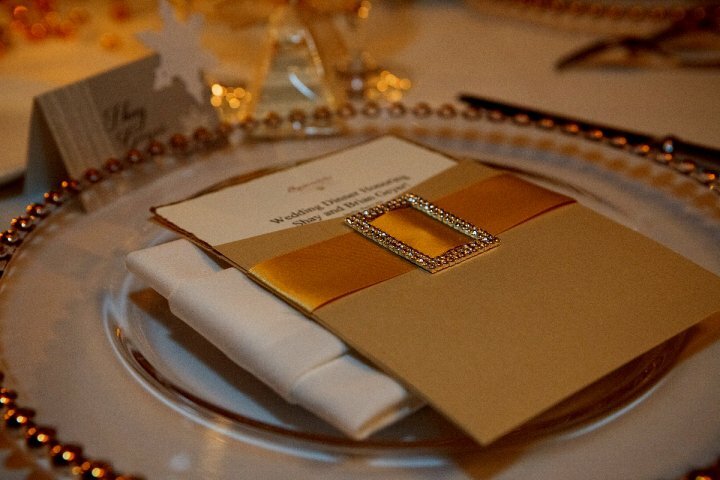 I think they really make the menu card & add a touch of bling! 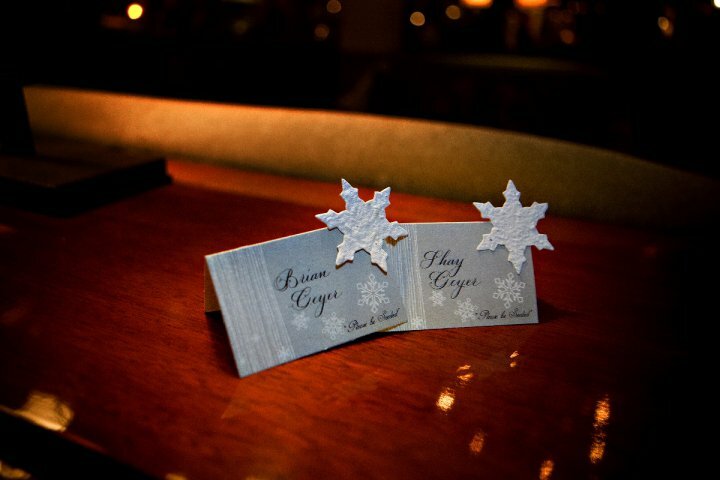 I loved our place cards! I thought the snowflakes added the perfect little touch for a winter wedding. The lower right of the card reads “Please be seeded”. The snowflake is embedded with wildflower seeds. 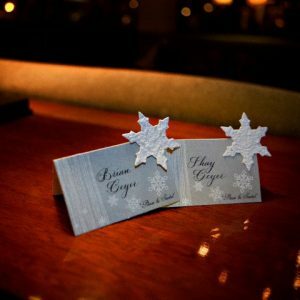 The guests could take their place card home & plant the snowflake & later enjoy their very own flower garden. So very eco-chic! I found them on-line here.